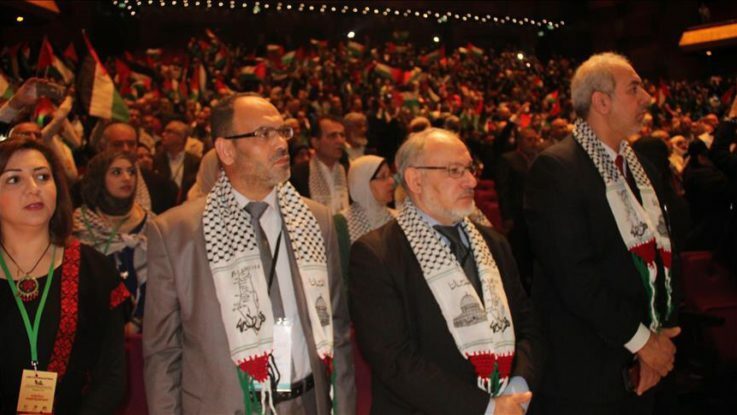 Thousands of Palestinians living in Europe gathered in the Dutch city of Rotterdam for a now-annual conference on Palestinian issues. Around 5,000 people from across Europe attended the one-day event which discussed Palestinian affairs under the key theme of the Balfour Declaration — the 1917 letter confirming support from the then British government for the establishment in Palestine of what it termed a “national home” for the Jewish people. Mazen Kheel, the organizer of the conference, told Anadolu Agency its aim was to bring together all Palestinians living in various European countries under a single roof and raise awareness about the Israeli occupation. Kheel said the conference would also strengthen ties between Palestinians in Europe and those in Palestine itself. “We are here to show our support to the people of Palestine,” said one of the attendees, Annemarie Hut, a volunteer at the Gaza-Rotterdam working group, composed mostly of Dutch nationals. Since 2003, the Palestinian-European conference has been held in 14 different cities and capitals of the European continent. It has become a permanent annual event held in cooperation with Palestinian associations in European countries.